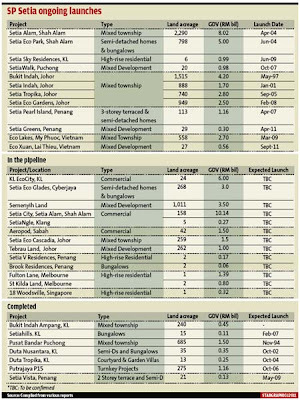 In an interview with The Star several years ago Tan Sri Liew Kee Sin looked out of his office windows in Setia Eco Park and pointed to the vast tract of oil palm land spanning 4,000 acres. “I have the land bank. To a developer, that is very crucial,” he said. Liew has more than a huge landbank. While land is the basic requisite for any developer to succeed, he has another foundation that made him what he is today perseverance and vision. The youngest son of a lorry driver and a rubber tapper, Liew grew up in a humble but loving environment in the new village of Plentong, Johor Baru. His parents instilled in him the values of hard work, determination and the importance of a solid educational foundation. When Liew bought that 4,000 acres that is today Setia Eco Park and Setia Alam in Shah Alam, he saw what other developers could not see. He saw the land, but he also leveraged on the New Klang Valley Expressway, a 35km expressway which runs between Kuala Lumpur and the Bukit Raja that was completed in 1993. Today, his vision for that land has helped him to brand one of the largest property companies by market capitalisation and carve a name like no other in the highly-competitive sector. Using this strength to go regional, the company has projects spanning the peninsula, east Malaysia, Vietnam, Singapore and Australia. Says another friend: “He has this ability to see opportunities in a crisis.” That positive spirit has drawn people to him. More than anything, he has nurtured a group of management team that is fiercely loyal and protective. Just as he is on call 24/7, his management staff are also on call 24/7. For many of his management team, they are essentially working for the personality behind the company. Liew himself is driven by vision and entreprenership. And like any other entrepreneur, the pursuit of profit. “He wants to make a profit, but he also wants his employees, customers, suppliers and partners to also have a good deal,” says a source close to him. “Liew's joint venture partners know they will have a good ride when they collaborate with him,” the source says. Like other entrepreneur-led developers Tan Sri Leong Hoy Kum of Mah Sing, Sunway's Tan Sri Jeffrey Cheah, E&O's Datuk Terry Tham (now taken over by Sime Darby Bhd) and Sunrise's Datuk Tong Kooi Ong (taken over by UEM group and controlled by Khazanah Nasional Bhd), one of the greatest factors which set them apart is their market research, speed of execution and vision, says a valuer. If one were to analyse each of these companies, staff loyalty plays a major role in the success of the company. 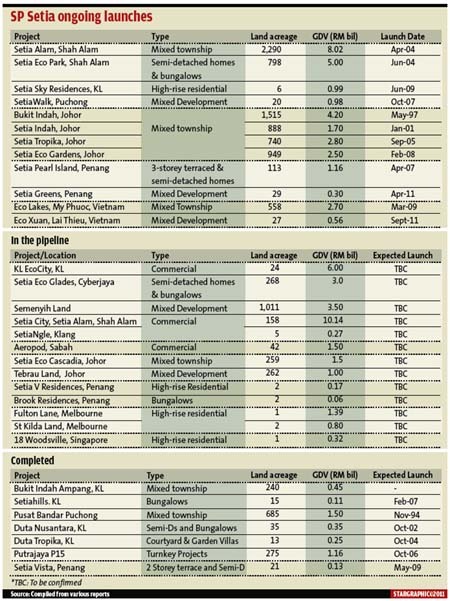 Taking a broader market outlook, another factor which helped these companies - and SP Setia - to be much coveted is the type of properties they have been delivering. The last decade or so, the property sector has taken a great leap forward in terms of design and variety. Security, gated and guarded residentials set amidst beautifully landscapped environments have become some sought-after criteria among the growing and large middle-income group. The names mentioned above do not just deliver rows of barrack-style housing. Instead, much thought has gone into their projects. “It's the soft skills that set these companies apart from the rest and make them attractive to government-linked companies,” says an analyst. They include leadership, speedy execution, management style and visionary goals - intangible qualities which cannot be manufactured but nurtured over decades. But no man succeeds alone and none of them did. Each of them has a strong management team. SP Setia was founded in 1974. Liew ventured into property development after being a banker for five years upon graduating from University Malaya with an economics degree. He started his own company, Syarikat Kemajuan Jerai Sdn Bhd in 1989, which was eventually bought over by SP Setia Bhd through a reverse take-over exercise in 1996. 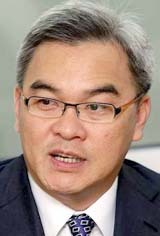 Liew was appointed CEO and group MD of SP Setia. In 1992, it was listed on the second board and transferred to the main board four years later. Under his leadership, the company grew to become one of Malaysia's largest company worth slightly over RM7bil compared with RM731mil in 1996.